Kathy leads one of the most innovative organizations advocating for the UN and the creation of public-private partnerships. Her leadership brings together the largest network of supporters of UN issues in the United States and a global network of corporate, civil society and media partners. The UN Foundation was created in 1998 with entrepreneur and philanthropist Ted Turner’s historic $1 billion gift to support UN causes and activities. The UN Foundation advocates for the UN and connects people, ideas, and resources to help the United Nations solve global problems. As a public charity with many partners, the UN Foundation’s work is focused on decreasing child mortality, empowering women and girls, creating a clean energy future, using mobile technology for development, and improving U.S.-UN relations. Prior to joining the UN Foundation as Chief Operating Officer in 2003, Kathy served as President of the AOL Time Warner Foundation where she guided AOL Time Warner’s philanthropic activities and was the chief architect of the company’s corporate responsibility initiatives. She joined America Online in 1997 as Senior Vice President and Chief Communications Officer, and was responsible for the company’s brand, social responsibility, and external relations. Immediately prior to joining AOL, she was a Senior Managing Director at Hill and Knowlton, a global public relations company, where she led the U.S. Media Relations practice. For 12 years before that, she served as Director of Editorial Administration for U.S. News & World Report, overseeing budget, personnel, innovation and strategy. From 1976 through 1984, Kathy served as Senator Gary Hart’s press secretary in his Senate office and his 1984 Presidential campaign. She was one of the first women to hold that title in American Presidential campaigns. 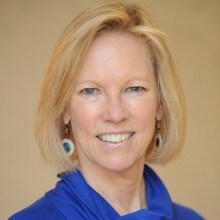 Throughout her career, Kathy Calvin has taken an active role in a range of philanthropic activities, including the boards of the International Women’s Media Foundation, City Year, Internews, the Newseum, Share Our Strength, the United Nations Association of the United States of America, and the East-West Center. She is a frequent public speaker and commenter. Kathy is a graduate of Purdue University.